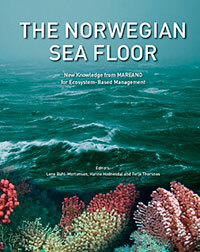 2015 was the ten years anniversary for Mareano, and on that occasion the previous Norwegian book published in 2010 was revised to cover activities and results from the whole period and translated to English. The title is ”The Norwegian Sea Floor” and the content covers the sea floor from the border from Russia to the Storegga shelf break, and the rich fishing banks off the Møre coast (in mid Norway). It describes bathymetry, surface sediments, bottom communities and pollutants in these areas. This is a colourful book with lots of information that we hope will convey the fantastic ocean with its hidden landscape sitting just outside the coast of Norway. Editors of the book are Lene Buhl-Mortensen, Hanne Hodnesdal and Terje Thorsnes.